We have 4 hosts, Cheryl @Meadow Mist Designs, Stephanie @Late Night Quilter, Terri Anne @Childlike Fascination and me, each posting about several new bloggers for you to check out every Monday over the course of 4 weeks. So after you have had some time to get to know more about the Quantum Quilters, please visit the other hosts to learn more about other new quilt bloggers! 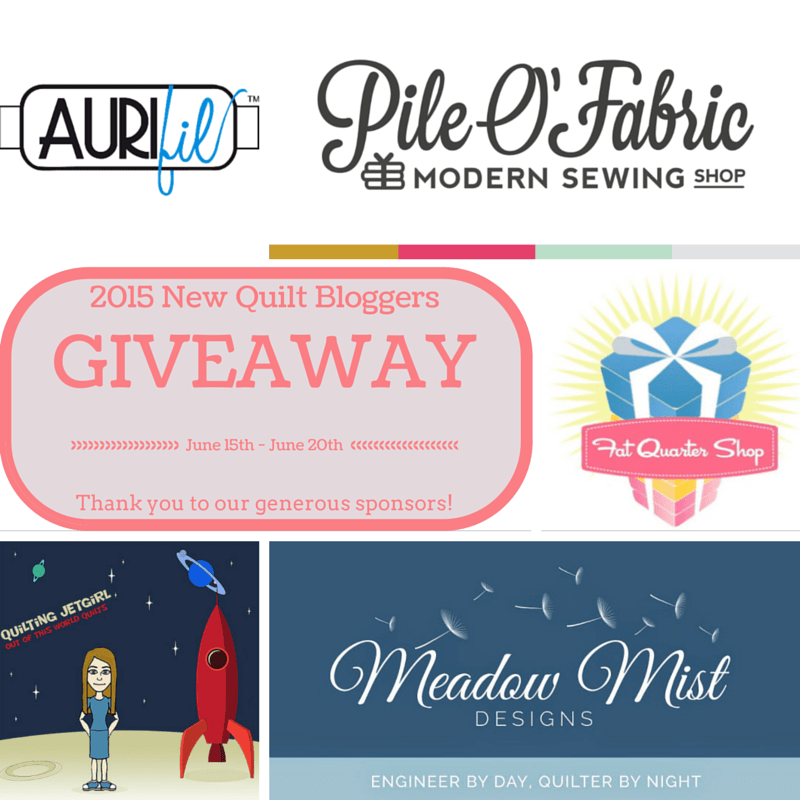 It’s a big blog hop, so that also means big giveaways. Scroll down to the bottom to check out this week’s awesome sponsors and big prizes. Answer a blogging related question: Why would you choose to follow a blog? Thanks so much for being a host for the hop this year, Yvonne. I am sure enjoying getting to know the participants! And I sure appreciate you sharing the links to the blogging tips. Diana’s post has reminded me how badly my Pinterest boards need attention! Hmmmm…. I follow a blog that inspires creativity and also has a good bit of humor in the mix. I love getting to know the personality that shows through. Thanksgiving is my all time favorite holiday. I chose to follow a blog when the individual posts frequently, shares some of the design process in their quilting and also tells you a little about their personal life. My favorite holiday is Thanksgiving. It includes many family members getting together without the stress of gifts, decorating, cookie baking, etc that Christmas brings with it. Just finished visiting your ‘Hive’! Loved every one! We are off to a great start! Thanks so much for hosting. I’ll follow a blog because the quilter inspiring and that encourages me to grow as a quilter/artist. I like and follower quilters who share their creative process, tools and techniques. I follow a blog, because I like the projects/quilts on it. Tutorials, tips and giveaways. My initial reason to follow a blog is the content and photos I see. What usually makes me stop following a blog is either the posts don’t coincide with what I originally thought was interesting to me, the blogger never replies to my comments, or (and this is a biggie) their blog is too busy looking and has a difficult to read font. I just want to make sure you enter the giveaway: go this the link below to enter!! My favorite holiday is Christmas, mostly for the decorating purposes and music. I’m not sure how I’ll keep up with the hop, but I’m sure going to try! I’m looking forward to meeting lots of new bloggers. Bit late here this week, but I’ve just been catching up on all the links above. And I must go and ‘like’ you on FB anyway, I’m so rubbish at FB that I really need to see how it’s done well! For the questions for questions sake – follow a blog when I feel some kind of connection, when I feel I’m getting to know the blogger and want to know what happens next with them. And holidays – Summer, Summer, Summer! Not sure that’s what you meant, but Summer anyway!